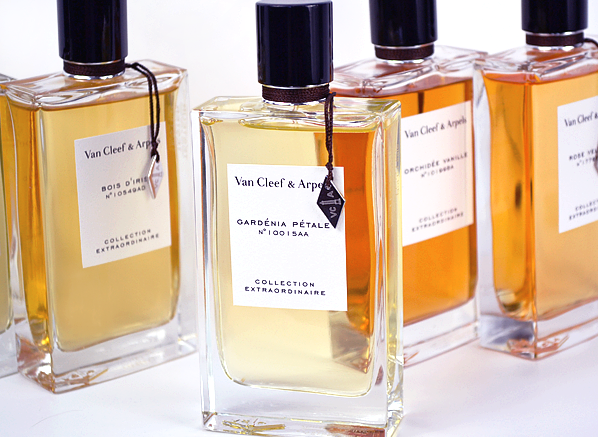 Up until very recently, Van Cleef & Arpels was not a brand whose fragrant offerings I was particularly familiar with. They are well known for the older scents, especially the Jean-Claude Ellena-penned ‘First’, which was created way back in 1976. It seems that in my ignorance, I have been missing out on some intriguing perfume blends, especially with the brand’s exclusive line – ‘Collection Extraordinaire’. For last week’s Escentual column I have reviewed all of the fragrances within the Collection Extraordinaire, including the latest addition – ‘California Rêverie’ (a more in-depth review of which, can be found here). This is, for the most part, a thoroughly well-executed collection that covers a wide range of familiar styles and serves as a rather understated approach to ‘niche’ perfumery. To read my review, simply click here. Don’t forget to let me know which of the collection is your favourite in the comments box. Images via Escentual. I write for Escentual as their Fragrance Expert and I am affiliated with the brand. My views however, are my own. Posted in Escentual, Perfume Reviews, Van Cleef & Arpels and tagged Bois d'Iris, California Rêverie, Collection Extraordinaire, Cologne Noire, Escentual, Gardénia Pétale, Orchidée Vanille, Perfume Review, Precious Oud, Rose Velours, Van Cleef & Arpels. Bookmark the permalink. I believe they are in most stores. John Lewis has them.